Is U.S. Media Coverage of Ukraine and Syria Even WORSE than Its Coverage of Iraq? Over the last year, we’ve documented that – despite all of the mea culpas for horrible Iraq coverage – the U.S. media’s coverage of Ukraine and Syria is just as biased, superficial and pro-war. In my four-plus decades in journalism, I have never seen a more thoroughly biased and misleading performance by the major U.S. news media. Even during the days of Ronald Reagan – when much of the government’s modern propaganda structure was created – there was more independence in major news outlets. There were media stampedes off the reality cliff during George H.W. Bush’s Persian Gulf War and George W. Bush’s Iraq War, both of which were marked by demonstrably false claims that were readily swallowed by the big U.S. news outlets. But there is something utterly Orwellian in the current coverage of the Ukraine crisis, including accusing others of “propaganda” when their accounts – though surely not perfect – are much more honest and more accurate than what the U.S. press corps has been producing. There’s also the added risk that this latest failure by the U.S. press corps is occurring on the border of Russia, a nuclear-armed state that – along with the United States – could exterminate all life on the planet. The biased U.S. news coverage is now feeding into political demands to send U.S. military aid to Ukraine’s coup regime. The casualness of this propaganda – as it spreads across the U.S. media spectrum from Fox News to MSNBC, from the Washington Post to the New York Times – is not just wretched journalism but it is reckless malfeasance jeopardizing the lives of many Ukrainians and the future of the planet. Media coverage of Syria is also arguably worse than of Iraq. Of course, the corporate media is always pro-war and pro-empire. 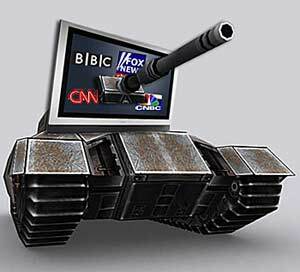 But now the large “alternative” media outlets – such as Drudge and Huffington Post – are also beating the war drums as loudly as they can. So you’ll hear scary stories that terrorists in Syria are a threat to the U.S. … but you won’t hear that the U.S. has been planning regime change in Syria for 20 years straight (and see this), or that the U.S. and its allies are the ones who pumped up those terrorists in the first place. You’ll be told that Russia will start World War 3 if we don’t launch a military campaign in Ukraine … but you won’t hear that that the U.S. has planned on taking control of Ukraine since 1997, or that the former Ukrainian Security Chief alleges that the new neo-Nazi government was behind the sniper attacks which turned the West against the old regime in the first place.